Contested #4 has concluded and the winner has been notified. They will receive a signed copy of Tentacles. Of course this means that Contest #5 has commenced. If you want to win a signed copy of “I,Q Book Two: The White House go to my Contest page, follow the rules carefully, and answer the question. One winner will be chosen randomly among those who have the correct answer. This contest will run through September 30th. 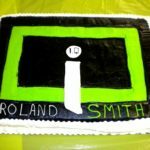 The I,Q cake was made by a school I visited last year. It’s so cool I just had to show it again.